Sign-up to receive SAALT emails, and follow us on Facebook and Twitter to receive timely updates on our activities and calls to action. 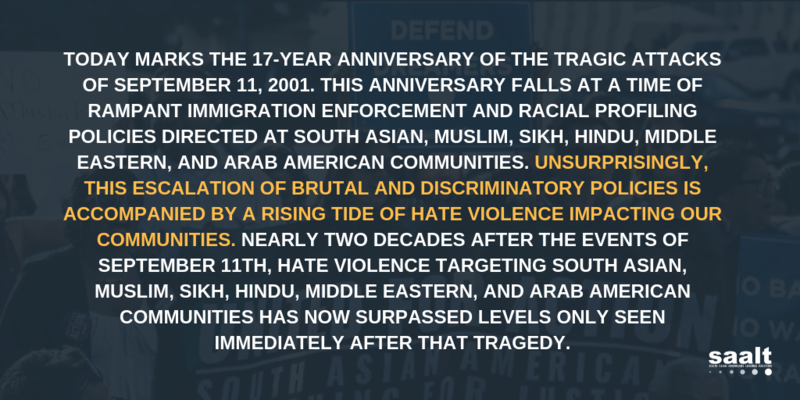 SAALT, along, with our allies have been tracking hate violence against South Asian, Sikh, Muslim, and Arab communities in the United States since November 2015. We are encouraging individuals to report any acts of hate against our communities on our live database. SAALT is engaged in national level policy advocacy focused on hate violence, immigration, and civil rights and liberties. Explore SAALT’s resources to educate yourself on the policies that impact South Asians in the United States. Words and statements matter. Become a Social Media Ambassador for SAALT by helping us amplify our collective voice through sharing social media posts on Facebook and Twitter and participating in online campaigns. We will periodically send you sample posts and tweets to send out to your networks. Currently we use #TrackHate to identify acts of hate against our communities and to push our followers to report these cases on our live database. E-mail vivek@saalt.org. South Asian communities in the United States have a range of needs and concerns. The National Coalition of South Asian Organizations (NCSO) is made up of over 50 nonprofits, collectives, and volunteer groups in different regions of the country committed to social change. These organizations are working on the ground to assist South Asians Americans who are confronted with a number of barriers. If interested in connecting with a NCSO partner in your region contact sonia@saalt.org. The National South Asian Summit is hosted by SAALT every two years in Washington, DC. The next summit will take place in April of 2017 and will be its 10th anniversary. The Summit is an opportunity for organizational leaders and community members to: engage with policymakers and government agencies; participate in a learning environment; discuss emerging issues in South Asian American communities and country as a whole; and, strategize to achieve best practices, discuss collective solutions, and agree to common principles using a progressive, social justice framework. E-mail sonia@saalt.org. SAALT’s internships enable students to work on numerous issues affecting South Asian American communities including immigration, civil rights and civil liberties, hate violence, and racial justice. We encourage applications from undergraduate, graduate, and law students who are self-motivated and committed to working toward social change in their communities. E-mail sonia@saalt.org. Utilize your unique skills and talents to advance SAALT’s work. Projects could include conducting a limited amount of research, helping us improve our database, writing an op-ed, contributing blog posts, and more. E-mail sonia@saalt.org. Support SAALT’s efforts around issues that impact South Asians in the United States through a tax deductible donation. Every dollar you give will directly support SAALT’s work on issues that matter to our communities, such as immigration, civil rights and civil liberties, hate violence, and racial justice. Donate Now. E-mail info@saalt.org.